Today (July 12th, 2017) a large number of sites have joined together to raise awareness of the threats to network neutrality. For example, reddit has a pop-over window that slowly types a message beginning with “The internet’s less fun when your favorite sites load slowly, isn’t it?” This is certainly a valid concern, and many people, including myself, have legitimate concerns about how the Internet is regulated. 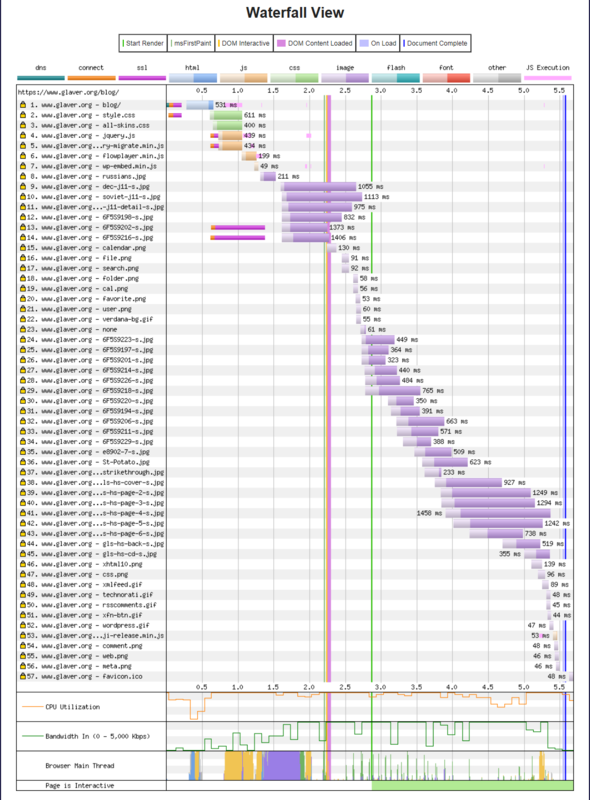 But there are enough sites raising that point, so I’d like to talk about something different – how sites are “shooting themselves in the foot” with slow-loading (and often buggy) page content. Next, the site decides they’d like to help cover the cost of running the site by having a few advertisements. So they add code provided by the advertising platform(s) they’ve selected. So their page now loads a bit slower, and users see ads, but the users will still come for the content, right? And the occasional malware that slips through the advertising platform and gets shown on their site isn’t really their fault, right? They can always blame the advertising platform. Somewhat later, the site gets an “offer they can’t refuse” to run some “sponsored content”. The page gets even slower and users are having a hard time distinguishing actual content from ads. Clicking on what looks like actual content causes an ad to start playing, or triggers a pop-under, or any one of a number of things that make for an unpleasant user experience. Once everyone is used to this, things appear to settle down. Complaints from users are infrequent (probably because they can no longer figure out how to contact the site to report problems). Everyone has forgotten how fast the site used to load, except for the users running ad blockers, cookie blockers, script blockers, and so on. But one day a SSL certificate becomes invalid for some reason (expired, a site was renamed, etc.) and the users are now getting a new annoyance like a pop-up saying that the certificate for btrll.com is invalid. Most users go “huh?” because they weren’t visiting (or at least they thought they weren’t visiting) btrll.com. Clicking the “close” button lasts for all of a second before the pop-up is back, because that ad site is determined to show you that ad. In frustration, the user closes their browser and goes out to buy a newspaper. By this point, perhaps 5% of the actual page content is from the site the user was intending to visit. The rest is user tracking, advertising, and perhaps a bit of malware. There is a free tool run by WebPagetest.org which will let you analyze any web site to see what it is loading and why it is slow. It does manage to load in less time than CNN, but it is still pretty awful. Since the entire report fits, I didn’t need to add an unreadably-small overview image. 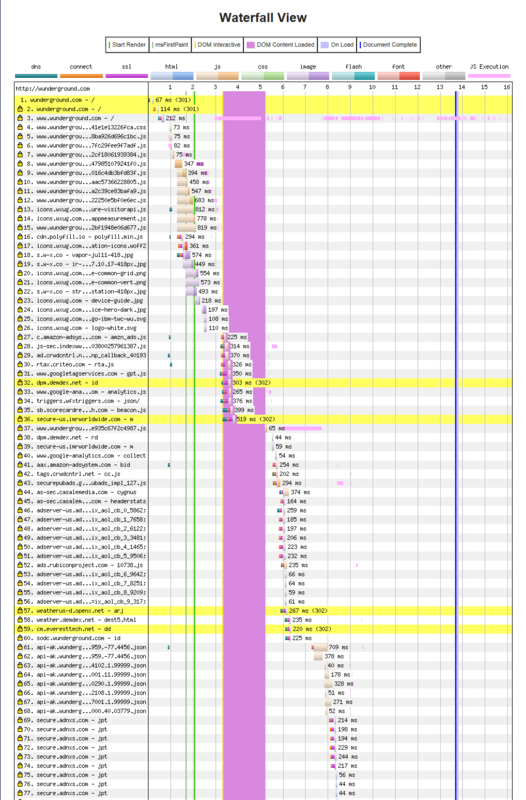 If you manage a web site, I encourage you to try WebPagetest.org yourself and see why your site is slow. If you’re just a user, you can also use WebPagetest.org to see why the sites you visit are slow. If you’re using add blocking or site blacklisting software while you browse, the list of hosts that are serving advertisements or other unwanted content will probably be useful to you when added to your block / blacklist. * As they say, “If you aren’t paying for it, then you are the product being sold”. Is no crypto always better than bad crypto? SSL (Secure Sockets Layer, the code that forms the basis of the https:// in a URL) can use any number of different encryption methods (protocols) and key strengths. While all of the protocols / strengths were presumed to be secure at the time they were designed, faster computers have made “cracking” some of the older protocols practical, or at least potentially practical. Additionally, concerns have been raised that some of the underlying math may have been intentionally weakened by the proponents (for example, NIST and the NSA) of those protocols. Perhaps an underlying flaw in the protocol has been discovered. Due to this, web browsers have been removing support for these older, insecure protocols. Additionally, even if a protocol is still considered secure, a browser may start enforcing additional requirements for the SSL certificate used with that protocol. “Under the covers” this is a rather different situation, but for the purpose of this discussion I will lump them together, since the average user doesn’t care about the technical differences, only that a service that they used to be able to access no longer works. In theory, this is a good idea – nobody wants their financial details “sniffed” on the way between you and your bank. However, the browser authors have decided that all usage of those older protocols is bad and should be prohibited. They make no distinction between a conversation between you and your bank vs. a conversation between you and another site (which could be a web server, UPS – battery backup, a water heater, or even a light bulb!) in your house or company. Instead, they force you to disable all encryption and communicate “in the clear”. 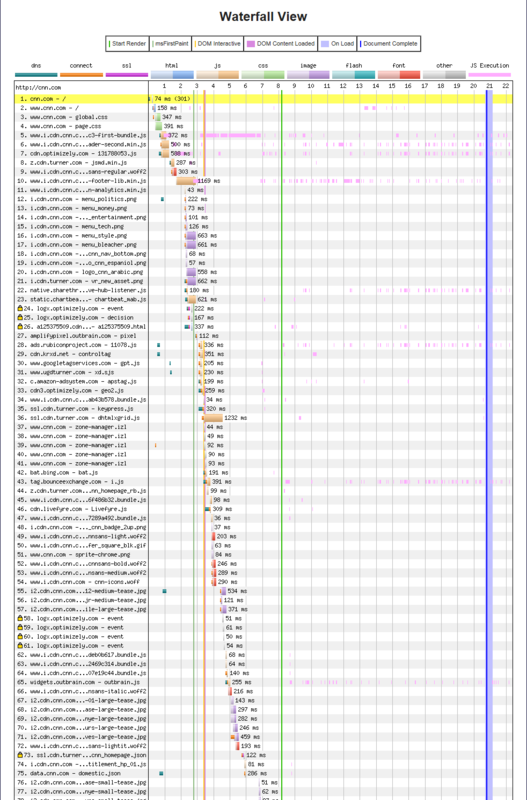 To add to the complexity, each browser does things in a different way. And the way a given browser handles a particular situation can change depending on the version of the browser. That isn’t too bad for Internet Explorer, which doesn’t change that often. Two other browsers that I use (Mozilla Firefox and Google Chrome) seem to release new versions almost weekly. In addition, the behavior of a browser may change depending on what operating system it is running under. Browsers also behave differently depending on when the host at the other end of the connection obtained its security certificate. A certificate issued on December 31st, 2015 at 23:59:59 is treated differently than one issued one second later on January 1st, 2016 at 00:00:00. In the following discussion, the terms “site” and “device” are generally interchangeable. I sometimes use the term “device” to refer to the system the browser is attempting to connect to. “Site” might be a more accurate term, but for many users a “site” implies a sophisticated system such as an online store, while an intelligent light bulb is more a “device” than a “site”. In a perfect world, people could just deal with the browser blocking issue by installing new software and / or certificates on all of the devices they administer. Sure, that would be a lot of work (here at home, I have several dozen devices with SSL certificates and in my day job, I have many hundreds of devices) and possibly expense (the companies that sell the certificates don’t always allow users to request updated certificates for free, and updated software to handle the new protocol may not be free – for example, Cisco requires a paid support contract to download updated software). However, it is not that “easy” – any given device may not have new software available, or the new software still doesn’t handle some of the latest protocols. This leads to an unfortunate game of “whack-a-mole”, where a browser will change its behavior, a company will implement new software to deal with that new behavior, but by the time the software has gone through testing and is released, the browser has changed its behavior again and the updated software is useless. A number of vendors have just given up supporting their older products because of this – they have finite resources and they choose to allocate them to new products. The browser authors seem to feel that this is just fine and that users should either turn encryption off or throw away the device and buy a new one. Since the “device” is often a management function embedded in an expensive piece of hardware, that simply isn’t practical. A home user may not feel that replacing a working device is necessary and a business likely won’t replace a device until the end of its depreciation cycle (often 3 or 5 years). This strikes me as a very poor way for browsers to deal with the situation. Instead of a binary good / bad decision which the user cannot override, it seems to me that a more nuanced approach would be beneficial. If browsers allowed continued usage of these “obsolete” protocols in certain limited cases, I think the situation would be better. First, I agree with the current browser behavior when dealing with “Extended Validation” sites. These are sites that display a (usually) green indication with the verified company name in the browser’s address bar. In order to purchase an EV certificate, the site needs to prove that they are who they say they are. For example, your bank almost certainly uses an EV certificate. Users should expect that sites with EV certificates are using secure methods to protect connections. If a site with an EV certificate is using an obsolete protocol, something is definitely wrong at that site and the connection should not be allowed. Second, the current behavior is OK when dealing with well-known sites (for example, amazon.com). This is a little more difficult for browsers to deal with, as they would need to keep a list of sites as well as deciding on criteria for including a site on that list. However, there already is a “master list” of sites which is shared between various browsers – it is called the HSTS Preload list. It could be used for this purpose. Display a warning box the first time a site is accessed via an insecure protocol and let the user choose whether or not to proceed. Re-display the warning after a reasonable period of time (perhaps 30 days) and ask the user to re-confirm that they want to use the insecure protocol to access the site. On each page, indicate that the page is using an insecure protocol. This could be done by displaying the URL in the address bar on a red background or similar. Google Chrome does something similar with its red strikethrough on top of the https:// in the address bar. Unfortunately, in most cases Chrome will simply refuse to access a site it deems insecure. NOT require dismissing a warning each time the user accesses the site. NOT require a non-standard way of specifying the site URL in the address bar, bookmarks, etc. Security experts will probably be thinking “But… That’s insecure!” It certainly is, but is it less secure than using no encryption at all (which is what the browsers are currently forcing users to do)? I don’t think so. In many cases, both the user and the site they are connecting to are on the same network, perhaps isolated from the larger Internet. For example, most devices here are only accessible from the local network – they are firewalled from the outside world. Technical note: I am only talking about insecure protocols in this post. There is a different issue of bugs (problems) in some particular implementation of SSL – for example, OpenSSL. However, those problems can usually be fixed on the server side by updating to a newer SSL implementation version and generally do not remove protocols as part of fixing the bug. My post is focused on servers that are too old and / or cannot be updated for some reason, which is a completely different issue from server implementation bugs. What do you think? I’d like to see comments from end users and security experts – feel free to try to shoot holes in my argument. I’d love to see comments from browser authors, too. That pretty much sums up my feelings about the firmware update “procedure” Brother provides for their printers. Some time ago I purchased a Brother HL-6180DW to replace an aging LaserJet 2200DN which had decided to either feed multiple sheets or no sheets from the paper tray. “No problem,” I thought to myself “I’ll just download the latest printer firmware.” I discovered that it is nowhere near that simple. The first thing I did was download the latest updater from the Brother support site. Running the updater produced an un-helpful “Cannot find a machine to update.” error. Searching on the support site, this is apparently because I did not have the Brother printer driver installed. Of course I don’t – the whole purpose of this printer is to emulate printers from other manufacturers so people don’t have to install drivers when replacing the printer. Connect your computer to the Internet. Connect the Brother machine to your computer with a USB cable. So, in order to install a network printer driver I don’t want, I have to find a USB cable and connect the printer to a PC via a USB port? That is downright bizarre… Armed with a USB cable, I do that and lo and behold, a new printer shows up which claims to be the Brother, attached via USB. None of which has any effect whatsoever. After more flailing around, I decide on a desperate measure – I will change the printer port from USB to TCP/IP in the printer properties. A miracle – running the update utility produces a request for the printer’s management password, after sending my personal data Yet Again to Brother (or is that Big Brother?). After an extended period of watching the progress bar move at a varying rate (and jump from 80-odd percent complete to 100% complete), the update has finished! After making sure I can still print from the other computers who still think they’re talking to a LaserJet 2200DN, I go back into the PC I used for the updating and re-enable Windows Firewall. Then I re-enable the Cisco firewall protecting my Internet connection. Lastly, I restore all the settings that I changed on the printer. Back to Chrome to make sure this fixes the https strikethrough… no such luck. Hours wasted for no gain. I have NO IDEA why Brother thinks this is a good idea. Maybe they’re paranoid about people getting access to the firmware images (although anyone with access to the network and a copy of Wireshark could capture it “on the fly”). The update utility messages could be vastly improved, instead of the “Doh! (Homer Simpson) that it does now. The support documentation could also be improved to actually explain what the utility needs in order to update the firmware. Of course, my decade-old HP LaserJet 9000DTN came with an add-in network card which has a simple “download firmware update from HP” button (which, amazingly, still works despite HP having rearranged their web site multiple times since that card was new). In a corporate network where I would have to get IT support involved in disabling my PC’s firewall, or (good luck!) disabling the corporate firewall in order to satisfy the Brother update utility, I think people would simply give up and not update the printer firmware. And don’t think you can cheat and tell Brother you’re running Linux – the downloads for Linux don’t include a method to update the firmware. Today I’m going to expand on the advice I provided in my earlier post, “A few words of advice for used equipment sellers“. Today I’m going to address the issues with “As-Is / Not Working / For Parts Only” listing types. These are terms used by eBay, but this advice also applies to anyone else selling equipment in this category. Any buyer who purchases items in this category is hoping to find a bargain by ending up with a piece of working equipment after performing minimal repairs. [There are probably people who buy this material for other purposes, such as scrap metal recovery, components for artwork, and so on, but I’ll leave those out of this discussion.] As such, you (as the seller) want to provide as much information as possible to potential buyers so you both end up with a good experience. Unable to test / Not tested – this means that the seller lacks the ability to test the item, either because it is a sub-component of a larger device the seller does not have, lack of necessary cabling to connect it, or due to it requiring specialized test / calibration equipment. Items in this category are truly untested and may or may not work. This category should NOT be used for items that the seller did test, but were found to be non-operational. It should also NOT be used for equipment with obvious physical defects which would make the unit not fit for use. Tested to power on only – this means the seller was able to apply power to the unit and it did something. Perhaps the seller lacked cabling or test equipment to perform further tests. Any observed behavior (patterns and colors of indicator lights, fans turning / not turning, unusual beeps or other noises, etc.) should be described in detail. Like the above category, it should not have any of the defects noted by NOT. Tested, found defective – this means that the seller was able to perform further testing and determined that there was indeed a problem with the unit. The seller should clearly state the nature of the defect (to whatever extent they investigated), such as “no console output”, “Status light solid red”, “displays fatal error message”, and so forth. Again, any physical defects would bump this to a lower category. Tested, found defective, investigated in depth – in this category, the seller has somewhat more knowledge of the device and has done further investigation. There might be concealed damage or the seller might have disassembled the unit to investigate further. Essential components may have been found to be missing. Any results of the investigation should be included in the listing, and the seller should return the unit to the condition as found (re-installing all components, including case screws, etc.) or note in the listing why this was not done. Physical damage, repairable – the device has some sort of physical damage which renders it partially or completely unusable, such as damaged connectors, bent or broken components, etc. The damage should be described as completely as possible, preferably with good quality photographs of the damaged areas. Buyers should evaluate the usability of the device without using the damaged areas or their ability to repair the damage. Note that modern electronic equipment often uses surface-mount components on multi-layer circuit boards, meaning that the skills and equipment needed to perform the repairs are beyond the reach of most users. Physical damage, non-repairable – the device has obvious physical damage which would prevent it from being repaired or being usable as a complete unit. Sometimes it may be possible to salvage components from the device (power supplies, faceplate, memory, etc.). The damage should be described as completely as possible, preferably with good quality photographs of the damaged and un-damaged components. Now, I’d like to provide a few examples of actual listings that I’ve purchased, and what I’ve found. I am not naming any sellers here, since it is possible that they received the item from somewhere “up the food chain” and did not investigate it completely. Catalyst WS-C4948-10GE switch – Listing simply said “Being sold AS IS for Parts or Not working. Power on but no console. No return, No refunds. AS IS!!!“. The listing also included pictures of the device, including one which showed the status LED being red. When I received this unit, the first thing I did was open it up to make sure there were no loose parts inside. During this inspection I discovered that 12 of the 14 screws that hold the cover on were missing and that the memory battery backup battery had been ripped off the main board (and was nowhere to be found inside the chassis). I also found that all of the screws holding the main board to the chassis were loose (but at least they were all present). Based on this, I determined that someone had been inside the unit already and had diagnosed it at least as far as removing the main board. I contacted the seller and they said they received it that way from the company that was using it, and the company ripped the battery off to erase the config because they were “security conscious”. Soldering in a new battery was not sufficient to get the switch working. I suspected the problem might be due to defective memory components soldered onto the main board, as described in this Cisco Field Notice. I ordered a tray of memory chips from a specialist in obsolete components (they are long-discontinued DDR333 parts) and replaced the two chips on the underside of the board. Since the ones on the bottom were made by Micron and the 3 on the top were from Samsung, I guessed (correctly, as it turned out) that the fault was in the Micron ones. After reinstalling the main board in the chassis and powering the switch up, I was greeted with the normal startup messages on the console*. After enabling priv mode in ROMMON, I tested the memory for an hour or so and it passed without errors. I then updated the ROMMON and IOS to the latest versions and gave the switch a 72-hour burn-in test, which it passed. Not bad for $255 plus another $10 in replacement memory chips and an hour or so’s work. * To my amusement, it appears that the battery on this switch is only used to maintain the date/time, not power the configuration memory. When the switch booted up after I repaired it, it put up a full-page banner with dire warnings about accessing the network without authorization, part of the saved config file that it had retained the whole while. More items to be added as I purchase them. 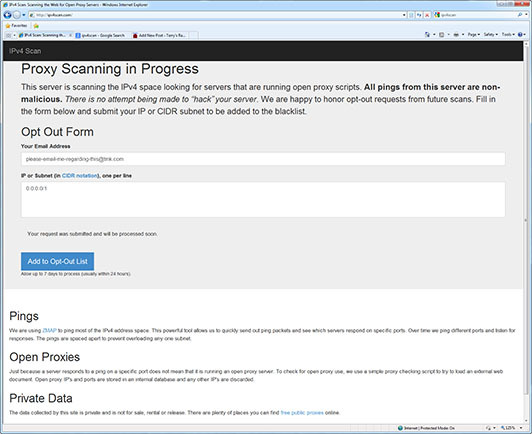 IPv4Scan.com – scan or scam? Now, I have nothing against most network measurement bots. Most are useful, and the rest are usually well-intentioned, even if they are counterproductive. The one thing these have in common is that they have a page that tells you what they’re doing, why they’re doing it, and who to contact if you have further questions. There is no contact information provided on the page, there is no statement of how the data is being used (other than that it is “not for sale, rental or release”). The web page source does not contain any useful contact information, either. So they’re collecting this data for their own, unspecified, purposes. ipv4scan.com mail is handled by 5 smtp09.topdns.com. ipv4scan.com mail is handled by 5 smtp01.topdns.com. Registrant Organization: Vindo International Ltd.
Admin Organization: Vindo International Ltd.
Tech Organization: Vindo International Ltd.
Well, this is definitely fishy. No legitimate survey would be hiding behind so many levels of indirection. I used the site's form to "opt out" 0.0.0.0/1 with an email address requesting they contact me about their project. I've also sent email to the abuse contacts shown above, pointing them to this blog entry, in the hope that they can get some sort of explanation from their customer. In the meantime, you may want to fine-tune your firewall rules to prevent this type of probe. That would (at a minimum) include blocking all outside connection attempts on ports 80 (http) and 443 (https) to anything on your network that is not intended to be a public web server. I cannot recommend using their opt-out form as there is no indication of what they do with the information. For all I know, it has the same effect as sending "unsubscribe" in response to a spam email - it just targets you for more spam. If I receive any information from my inquiries, I'll update this blog entry accordingly. Updated July 16th to document further idiocy – see the bottom of this post. Today provided yet another indication that Citibank (and by extension, MasterCard) have absolutely no clue about online security, and past events have shown that they simply don’t care. Today’s experience was triggered by an order on newegg.com. After clicking on the “confirm order” button, I was told that I might be redirected to my bank’s web site to confirm the order. So far so good – I’ve had experiences in the past where every single Newegg order caused my card to be flagged for fraud. But then I was greeted with a web page claiming to be “MasterCard SecureCode”, but with a URL showing “securesuite.net”, which demanded a bunch of sensitive info, including the last 4 digits of my SSN and my billing Zip Code. What the heck? Looks like an obvious phishing site. I let the page sit there while I contacted Citibank MasterCard. The agent said that it was obviously a fake and that I should never enter any info into an online form like that (a statement I strongly agree with). I clicked the “cancel” button and figured that I’d just place my order somewhere else. However, Newegg told me my order had been placed successfully and subsequently sent me an email letting me know that my credit card had been charged. Verified by Visa and SecureSuite: Legit or Phish? For an actual scholarly paper about this problem, I suggest reading “Verified by Visa and MasterCard SecureCode: or, How Not to Design Authentication“. If you browse to https://www.securesuite.net, you get (as of this writing) a blank page – it doesn’t even return any HTML headers. If by some chance you happen to find https://www.securesuite.net/csi/docs/contact_support.jsp, you’ll find a singularly uninformative page which contains such gems as “Call us at your Financial Institution’s support phone.” To be fair, that may just be a generic page not intended to be shown to users. The main point is that after telling us to never trust unknown web sites, the banks and credit card companies are sending people to just those sorts of sites. Talk about mixed messages! These companies should require the use of their own domains and SSL certificates rather than apparently-unassociated third parties, or at least correct information when users call them and ask if the third-party site is legitimate. It’s a sad day when I have to admit that PayPal does a much better job with this sort of thing than Citibank does. This total disregard for security isn’t just in their online communications, either. Citibank started sending me unsolicited “balance transfer” checks in the mail, despite my having gotten them to stop some years ago. I had to call yet again and have my account flagged to not receive them. I said to the phone rep “Who in this day and age thinks sending blank checks in the mail is a good idea?” and she agreed with me. She apparently gets lots of calls about this. As I wrote yesterday, I canceled the “MasterCard SecureCode” window and Newegg apparently processed my order, notifying me that they’d received the order and later that it had been successfully charged to my credit card. That’s where things were at the time I wrote the above post. Today at 6:37 PM (note that this is at least 12 hours after my Newegg order shipped – talk about “locking the barn door…”) I get the usual “Unavailable” Caller ID phone call from the Citibank Fraud “Early” Warning Department, telling me that my card has been frozen and asking me to confirm that my Newegg purchase was legitimate (oddly, they had no problem with my Amazon purchase later that same day). I told the agent it was, and explained that I’d received the phony-looking SecureCode page and after contacting the same department she was calling me from, who told me it was bogus and to never provide information on that sort of suspicious page, I clicked “cancel”. The agent proceeded to tell me how important the SecureCode was. She was unable or unwilling (perhaps due to the “script” they’re required to work from) to understand that her department was the one who told me to never provide that information. We went around in circles for about 10 minutes as I tried to get her to understand that, and also to get the point across that they are the ones who say to never provide information to an untrusted 3rd party. It’s easy enough to dismiss this as “somebody else’s problem”, but the banks, card companies and merchants are covering the losses they incur due to their own stupidity by charging everybody a little more. So it’s everybody’s problem – I just wish the bank could see that it is a problem entirely of their own making. I’m stunned by the revelation that the NSA is continuing to monitor all phone calls, collecting and storing for an indefinite length of time the phone numbers of both parties, the locations of both parties, and the starting time and length of each phone call. [Reference]. Apparently Congress was informed of this and yet not a single member appears to have raised any objection. President Obama, I voted for you (twice!) because you campaigned on a platform saying you were different from President Bush and would repeal the “surveillance state” legislation passed as a knee-jerk reaction to 9/11. Not to mention your promise to “Close Guantanamo Bay”. Instead, this is what we get? You make me ashamed to be an American. I purchase a good deal of used electronic equipment for both work and personal use. Some of that equipment comes from eBay, some is purchased from companies who sell used equipment for a living. The two aren’t mutually exclusive, of course – there are a number of commercial vendors who sell through eBay as well as their own site. Used equipment can represent a sizable savings over new, particularly when a manufacturer only has a “list price” and doesn’t offer discounts to any but their largest customers. Of course, you need to consider the cost of any required re-licensing (for example, on Cisco gear) when comparing the used price with new. But a large number of manufacturers make updates available for free to all, and in that cases you can often save a great deal of money. Most used equipment will come with at least a one-week warranty against being defective, but some sellers will offer a longer warranty – up to 1 year is common. One of the best times for great deals is just as a device is no longer being sold as new by the manufacturer. There’s a further drop once the manufacturer no longer supports it with software updates, spare parts, and so on – but you probably don’t want to buy something that far along unless you plan to use it for spare parts yourself. That’s the benefit to the buyer. But I’d now like to give some advice to sellers, both to ensure the largest market for their items and to avoid potential problems. If the device has any configuration data, erase it before listing the device for sale. Some devices have no way of resetting them to the default state unless the existing password is given, which means that if the seller doesn’t erase it before selling, the only way a buyer will be able to use it is if the seller is willing to tell them what the password is (not practical if it is the same password the seller is using on equipment they’re still using, or if they don’t know it). Otherwise, the device has to go back to the seller and the transaction voided. Some other devices have a “reset the password only” option, or (insecurely) a “backdoor” password that works on all units. If the user does that, they will have access to the entire configuration of the device as the seller last used it – at a minimum, things like IP addresses, SNMP communities, and so on. Potentially even more sensitive information like access lists can be disclosed. Additionally, at least two major brands of devices have the (undocumented, but widely known) ability to read or decrypt the original password cleartext once a password recovery procedure is performed. This is particularly important for disk drives and other storage media. Even if the drives were part of a RAID set, it might still be possible to recover chunks of data from individual drives. You can use a utility such as DBAN to erase drives that are still in the system. It offers a variety of erasure options, from a simple “write zeros to the whole drive” to multiple erase passes with random data. Note that even with this type of erasure, it may still be possible to recover data from certain areas of the disk (replaced defective sectors, for example). If you (or your company) doesn’t want to take the risk, you can remove the drives – but read on for a suggestion about disk trays and mounting hardware. If you’re selling something like a server and your company policy requires removal of the drives before the sale, put the empty hot-swap drive trays back in the server instead of trashing them with the drives. If the trays require oddball hardware to hold the drives in, put the screws in a small plastic bag and tape them securely to the disk tray(s). The buyer will thank you as they won’t have to scavenge for drive trays to get the server running with new drives. Unless you’re explicitly selling the item “as-is” or “non-working”, please test it before listing it. Having a 14-day (or longer) “no questions asked” return policy is nice, but neither the buyer nor you want to deal with shipping defective items back and forth. For some items, this can simply be installing (or leaving) them in a system and seeing if they work. Mechanical items like disk drives need some additional testing. Modern drives (anything in the last decade or so) have S.M.A.R.T. testing built in, so it is a simple matter to use something like smartmontools to test the drive and see if it has any problems before listing it. Just today I received a pair of SAS drives, each with less than 30 power-on hours on them, which had over 50 media errors each and had been logging S.M.A.R.T. errors since new (the first failure was logged at 0 power-on hours). Along with the above, it would be helpful to update the device to the latest available firmware “while you’re in there”, if that is something the manufacturer allows. I’ve received devices that were so old that several intermediate firmware updates were needed to get them to the current revision. In a number of those cases, the intermediate updates were themselves so old that the manufacturer had removed them from their web site as obsolete. That requires the user to go on a “scavenger hunt” through potentially untrustworthy sites to try to find firmware. Another reason to update before selling is that in some cases, the update procedure will only work in the specific brand of equipment the device came from. An example is Dell network cards – the Dell Server Update Utility only runs on Dell-branded servers. Dell network cards are mostly-generic Broadcom, Intel, etc. cards but often have Dell listed in the PCI Vendor ID on the card. This means that generic firmware updates from the manufacturer may fail to recognize the card. To continue my example, even if the user is putting the card in a Dell server, unless Dell offered the specific option card for the user’s server, the appropriate Server Update Utility may not detect / update it. Be as descriptive as possible when listing the item. To give a specific example of why this is a problem, look for “PowerEdge R300” on eBay. That model was available with or without hot-swap drives and with or without redundant power supplies. It is not possible to convert a chassis from any of those configurations to another. Many times a seller will just say something like “PowerEdge R300 Quad-core 2.33GHz 4GB 2x 146GB HDD”. That doesn’t convey much useful information – in addition to the chassis type, it would be useful to know the exact CPU model, whether the disks are SATA or SAS and if there’s an add-on disk controller in the system, and whether or not there’s a remote access card. This is made even worse by the sellers that say “Stock photo” or “Photo may not represent actual item”. To add insult to injury, some of those same sellers will say “if it isn’t in the picture, it isn’t included” in the body of the listing. Dell’s web site is pretty good – if you know the “service tag” of a system, Dell’s site will show you the configuration as it shipped from Dell. Of course, the seller or a previous owner may have added, removed, or modified components, so don’t take the Dell list as the last word. As the seller, you can go to the Dell site and copy/paste the configuration into your sale listing once you verify that it’s accurate. If you’re selling something that isn’t an add-on component (like a network card or a disk drive), but can function as a standalone device (like a server, Ethernet switch or network-controlled outlet strip), provide all of the necessary accessories with it or explain clearly that they’re missing. This definitely includes rack mount ears/rails (if the device is rack mountable) and console cables (no two vendors do exactly the same thing once you get to anything newer than 9-pin serial connectors). If the device has cable-management hardware (bracket, etc.) and you have it, include that with the item. Likewise for the faceplate. It is also thoughtful to include the required power cord, at least if the seller and the buyer use the same type of electrical outlets. This isn’t vital, as there are a small number of possible mating power cords for modern equipment. But the buyer will usually appreciate your thoughfulness, particularly if it is an unsual cord like an IEC C20 and they have to order one once they receive your shipment. Pack the item well, preferably using the original manufacturer packaging (if still available). You’d be amazed at the way some stuff arrives here. I’ve received memory DIMMs ratlling around loose inside a cardboard box. I’ve received servers where parts of the chassis were dented or damaged (usually parts that protrude beyond the basic rectangular shape, but sometimes the main chassis itself). I’ve received devices with glass faceplates that were smashed. I’ve received boxes where the cardboard was too thin for the weight of the item and has ripped during normal handling, with accessories falling out of the box and being lost in transit. I’d like to be able to say “just take the item to your nearest parcel store and have them pack and ship it”, but that’s generally not a good idea. It seems that their solution for shipping anything is a thin-wall cardboard box and packing peanuts. Those peanuts are not acceptable for anything that might shift around or settle in the box. With enough practice, it is possible to ship fragile items using common materials – I have purchased many items from ex-Soviet countries where the contents were packaged entirely (but carefully) in newspaper and placed in a cardboard box and which arrived here in perfect condition despite their international travel and the rough handling of various foreign postal services. Large items are generally either heavy or are light enough that they get charged “dimensional weight”, where the shipping company charges the package as if it weighs a certain amount per cubic inch. In general, the cost of reasonable insurance (value up to some hundreds of dollars) will be a small part of the total shipping cost, so it makes sense to insure the package. If you have to file a claim, be aware that you will often be asked to provide proof of adequate packaging before the shipping company will process the claim. I know of one company that took pictures of each box while it was being packaged and retained those pictures, both to deal with shipping damage claims and to prove that a certain item was in the box when it was shipped. If, as a seller, you follow these steps I think you will find that your items will sell faster and your customers will be happier. And if I’m the customer, I’ll definitely be happier. Dell has generally been quite good about making firmware updates available in a variety of formats. In addition to the normal Windows and Linux versions, most patches are also available as a floppy / USB image or an ISO image (depending on size). Those of us who don’t run one of the operating systems Dell provides support for appreciate them going through the trouble. However, newer updates for older systems and updates for newer systems seem to no longer provide standalone installers. In theory, Dell provides a quarterly packaged roll-up of all available updates on a pair of DVD images (CDU and SUU). Booting these and wasting about 10 minutes switching discs should get your system updated to the latest versions of all firmware without any additional steps. Unfortunately, the firmware for the R300’s ESM / BMC has not been on any SUU discs I’ve looked at, and the update is listed as “Critical Security Update” on Dell’s site (look under ESM on the R300’s downloads and drivers page). The only two formats it is available in are “Windows Update Package” and “Linux Update Package”. I figure that’s not a problem, as I can boot a Windows 7 recovery disk and then run the ESM update from a USB drive. Unfortunately, that doesn’t work. You get an error about “unsupported operating system”. Clicking on “Previous Versions” on the Dell page shows the previous version as 2.46 from 2009. Looking at the available formats, one is listed as “Hard-Drive”. Depending on the mood Dell is in when they create the kit, this could be anything from a freestanding binary that writes a floppy image to a drive, to creating an ISO file, or something that just unpacks into a bunch of loose files somewhere, perhaps then trying to run them (incorrectly) on the local system. Now all I needed to do was to find newer versions of the last 2 files inside either the Linux or Windows installer. The Linux installer was a pain, and I quickly gave up on it. I had much better luck with the Windows version (link here). Despite being an EXE file, I was able to use WinZip 16.5 to open the file (browse to the directory where you downloaded the Dell update, then make sure you’ve selected “All files (*. *)” in WinZip’s Open Archive dialog). There’s a whole load of un-needed stuff in there (which doesn’t completely explain how a 655KB update turns into a 4800KB Windows binary). Find the bmccfg.def and bmcflsh.dat files and extract them on top of (replacing) the ones from unpacking the older download. That’s all there is to it. If you want a pre-built .ZIP file with the flash utility and the 2.50 image, I have placed one here for your convenience. The bmcfl16d.exe utility has a number of documented and undocumented additional features. You can use the -help option to get a list of the documented features. Before using one of these features when updating a system, be sure you know what you’re doing and have a fallback plan in case the update fails and you’re left with a non-operable system. The above caution about knowing what you’re doing and having a fallback plan is doubly important if you try using any of the advanced options. Updated 23-Dec-2011 18:30: I received an email response to my letter stating that “Go Daddy is no longer supporting SOPA”. I’ll attach the complete response as the first comment to this post. There had been a bit of an Internet buzz about SOPA (the Stop Online Piracy Act). Yesterday, Tom’s Guide reported that Go Daddy published a blog entry supporting SOPA. There are a number of sites organizing “boycott Go Daddy” programs and advocating the transfer of domains to other registrars, for example in this post on Reddit and this one on TechCrunch. As someone who has registered a number of domains with Go Daddy, I wrote them a letter expressing my dissatisfaction with their policy. I’m including it in this blog entry, as I feel that others need to see it as well. Feel free to submit comments (either agreeing or disagreeing with me, but please keep it civil). Hopefully I’ll be able to keep comments open on this post without it degenerating into a free-for-all. I read your “Position on SOPA” blog, but since comments are closed there (for obvious reasons), I felt I needed to contact you to tell you my feelings on the subject. I’m retired these days, but I’ve been in the computer business since the mid-1970’s. I’ve been an owner or principal of hardware companies, software companies, and ISP’s in the last 40 or so years. There’s no reason for me to mention the names of any of them – some you’ve never heard of, some are quite well known. I (and my companies) have suffered economic losses from software piracy (though in those days, we called it “stealing”). So I support REASONABLE anti-piracy measures. However, as currently proposed I feel that SOPA is not a reasonable measure. It would force service providers and registrars to act as enforcement agents without requiring the complainant to provide a reasonable justification for the enforcement action. It is essentially a conviction without a trial or defense. Even the much-maligned DMCA provides for the accused to assert a counter claim. Under SOPA, the accused may not even know that they are the subject of an action, until they hear from their customers that their site is inaccessible. I would be much happier if you reserved your support for SOPA until it exists in a more balanced and practical form. In your own blog post, you use phrases like “changes we believe are necessary” and “room for some improvement”. As you repeatedly emphasize in your blog, you have over 50 million domains and a full-time presence in Washington. That gives you a very strong position to advocate changes to SOPA which would be more effective while still preserving the rights of the accused. I encourage you to reconsider your support of SOPA in its current form, and to work toward modifying it so that it will be both more effective in combating real infringing activities while also greatly reducing the chance that it will be abused. So, what's a glaver anyway?